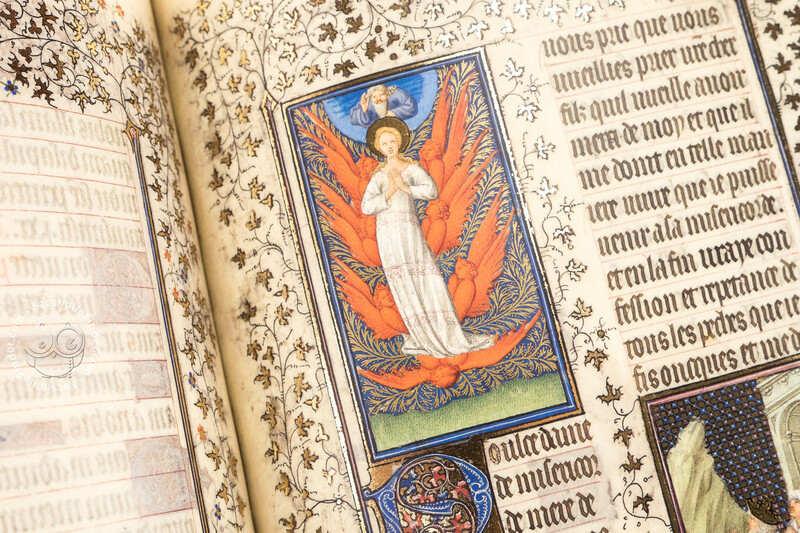 Jean de Berry is known above all as a connoisseur of the arts, a bibliophile collector and a commissioner of extraordinary art treasures and invaluable painted manuscripts. 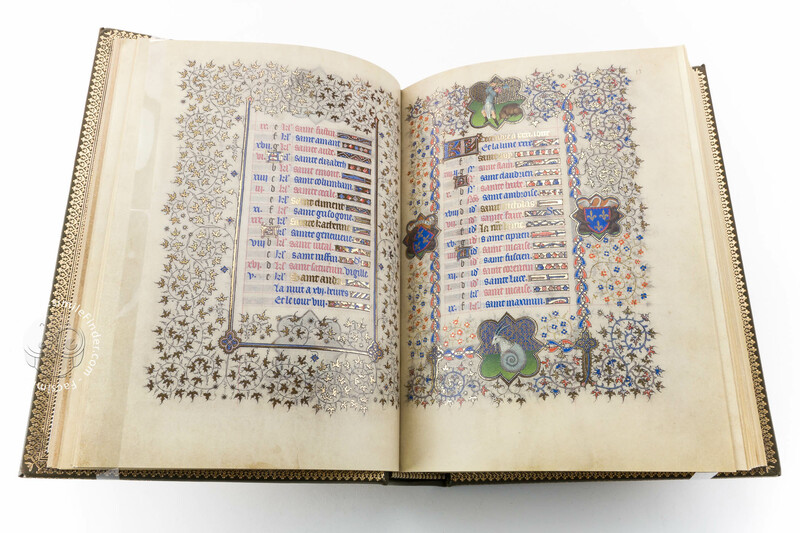 The legendary library of the Duke of Berry impressed even his contemporaries by its high quality and the elaborated decoration of most of its volumes. Jean de Berry was indefatigable in building up his own library: he commissioned works with the leading illuminators of his time, occasionally purchasing the most valuable manuscripts available in the bookstores or receiving them as gifts from relatives and friends. 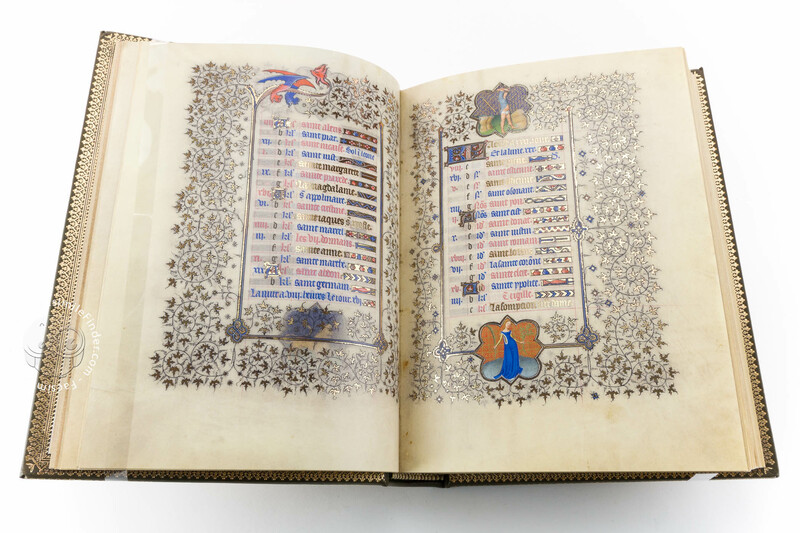 In his late years, the Duke of Berry owned a truly legendary library that comprised almost 300 manuscripts. 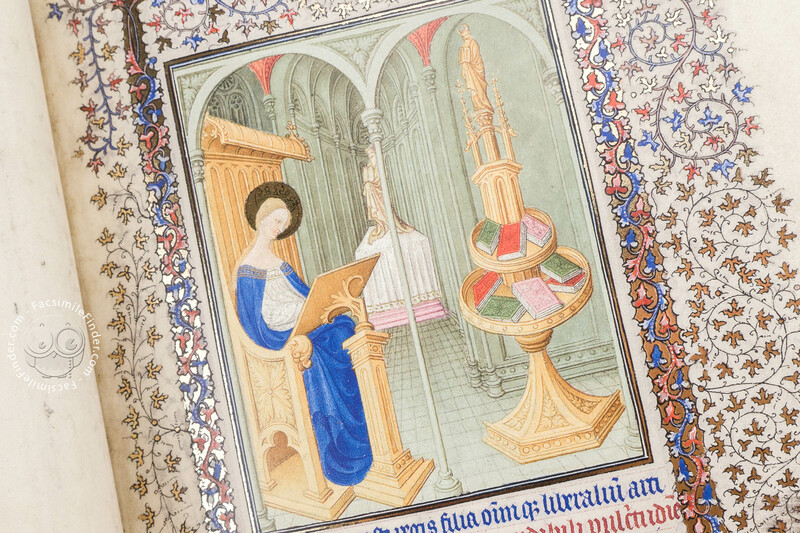 What impresses us today, however, is not only the great variety of his collections but even more the outstanding quality and rich decoration displayed in the majority of his volumes. 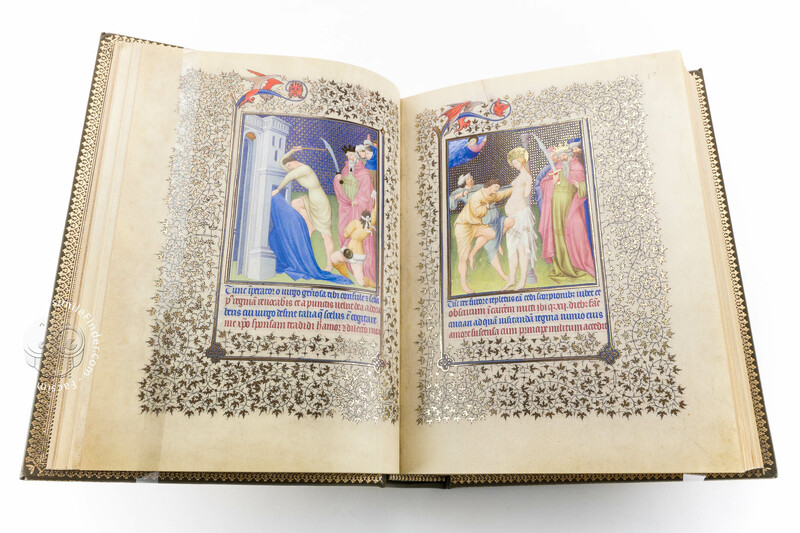 For his most personal Book of Hours, the Belles Heures, the Duke of Berry engaged the most famous book painters at this time Pol, Herman and Jehanequin Limbourg. 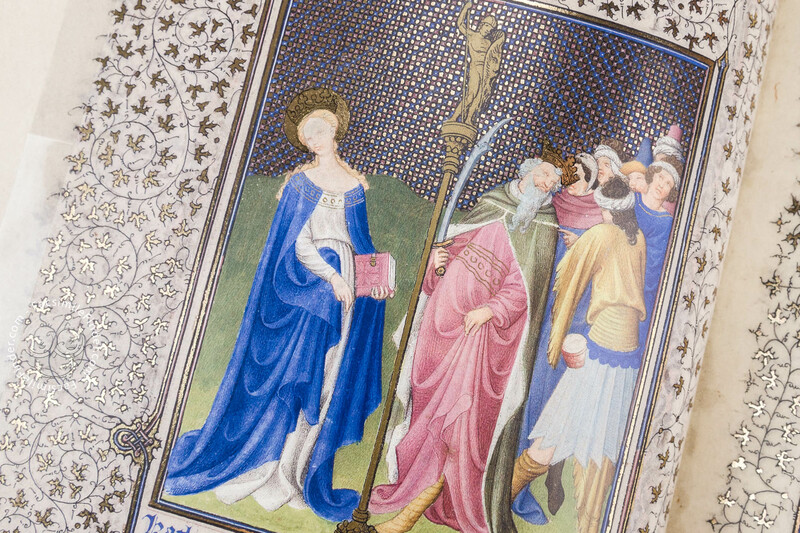 The Limbourg brothers were born in the last quarter of the 14th century, in Nijmegen, the capital of the Duchy of Gelderland on the Meuse. Their talent for the fine arts was not a matter of pure chance: their father worked as a wood carver and the three brothers grew up in the crafts quarter of the town. 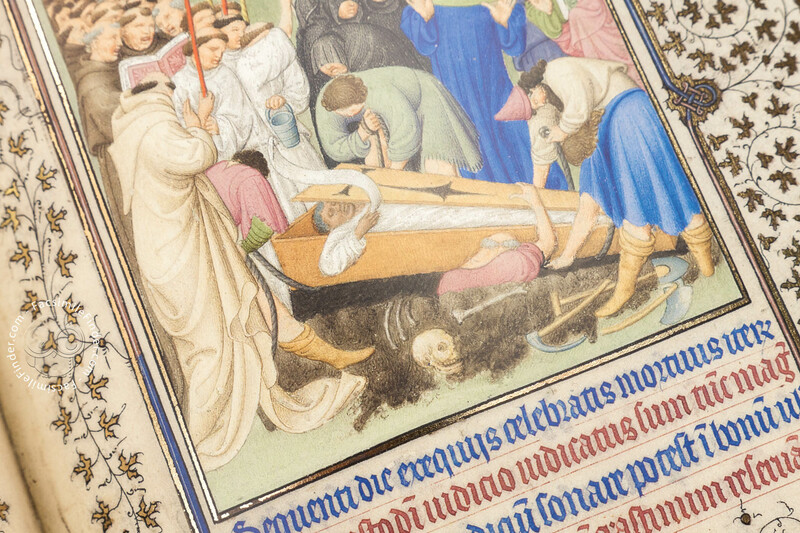 In Paris, the Limbourg brothers were first apprenticed to a goldsmith. 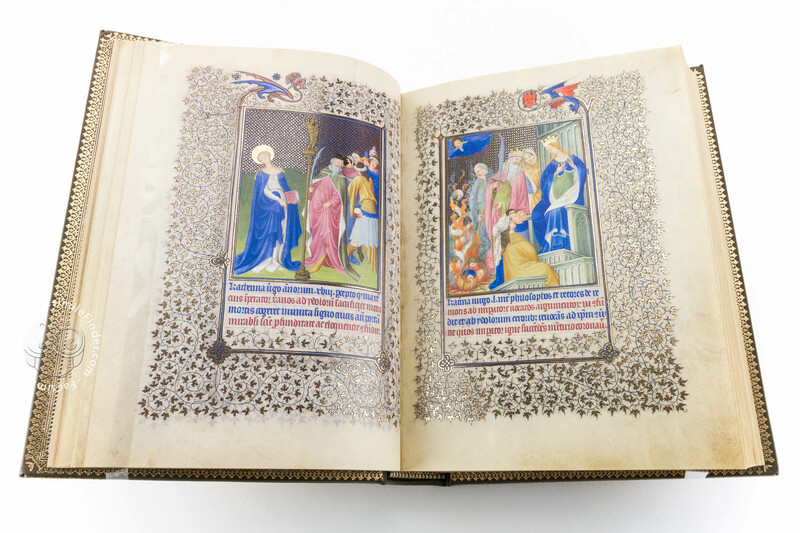 Around 1400, Pol and Jehanequin entered the services of the Duke of Burgundy whose brother, the Duke of Berry, had inspired him with his burning passion for beautiful books. 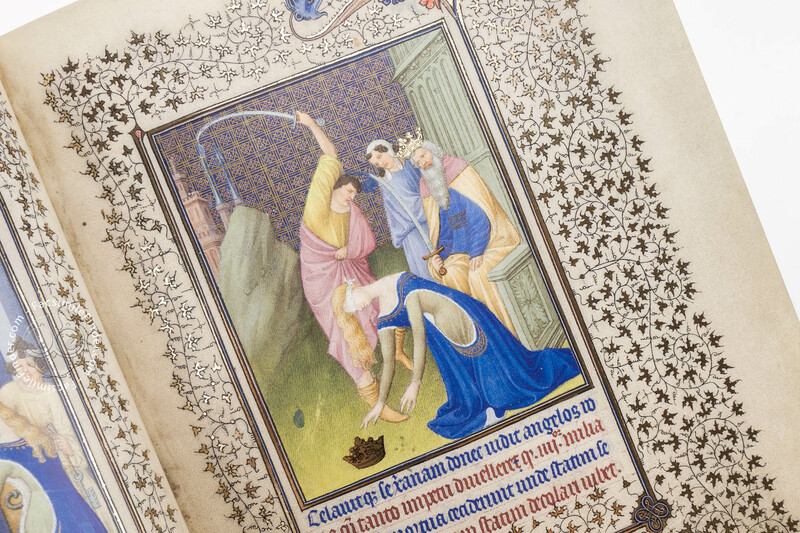 After their employer died in 1404, the Duke of Berry immediately offered all three brothers a position as painters to his court, entrusting them jointly with the decoration of a delightful Book of Hours, the Belles Heures. 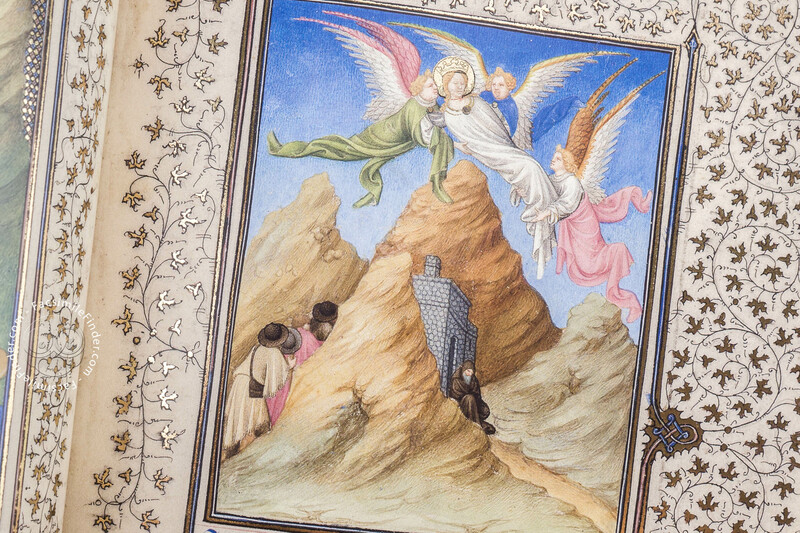 All the 172 miniatures of the Limbourg brothers have a vivacity and colourfulness that secure for them a place in the history of illumination. 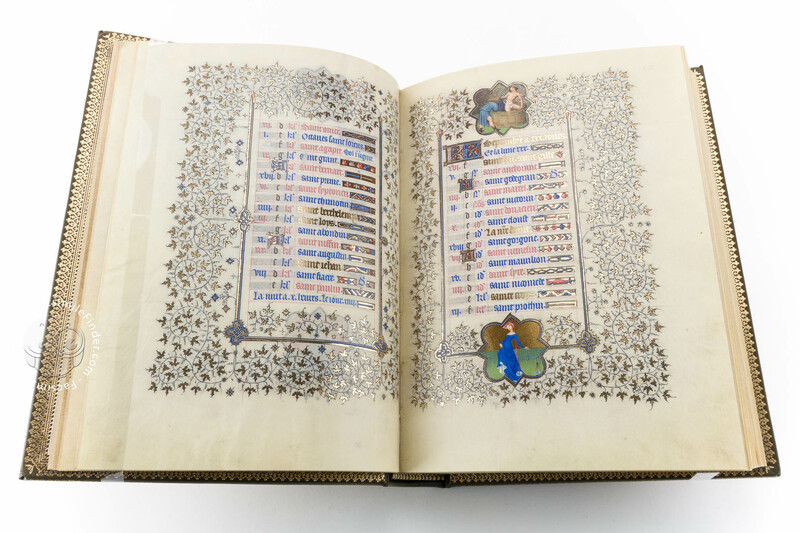 Every miniature and every page of the text of the Belles Heures of Jean Duke of Berry is surrounded by decorative filigree scrollwork with up to 500 gold glowing ivy leaves. 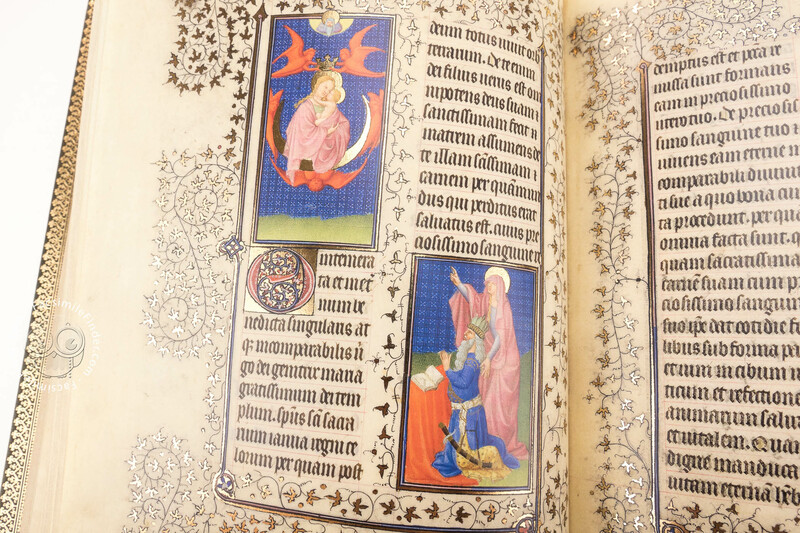 But even this sumptuous decoration is excelled by the playfully arranged luminous elements on the prime pages introducing the Office of the Virgin and the Office of the Dead. 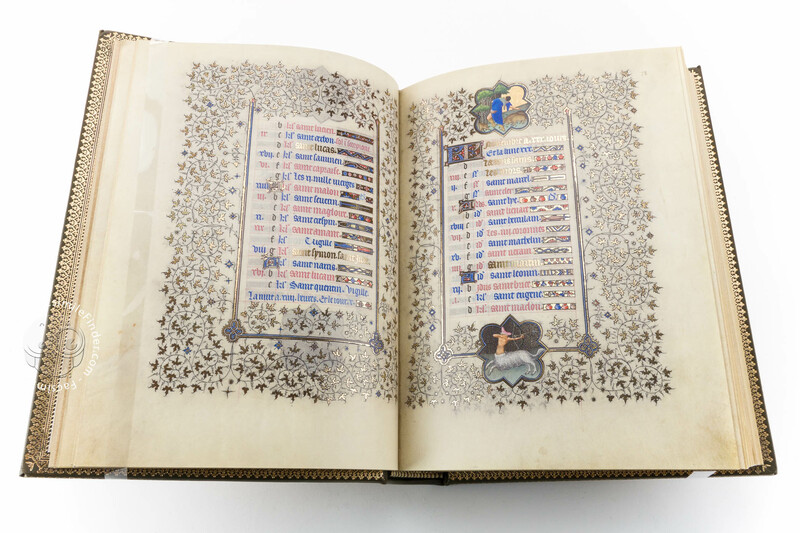 This luxurious decoration, which is extraordinarily exuberant even for a Book of Hours from the ducal library, achieves perfection in the use of countless ornamented initials that extend over one or several lines and are painted in red, blue and glowing gold – the colours of the ducal crest. The combination of gold leaf and shell gold in the miniatures creates permanently glowing and glittering effects. 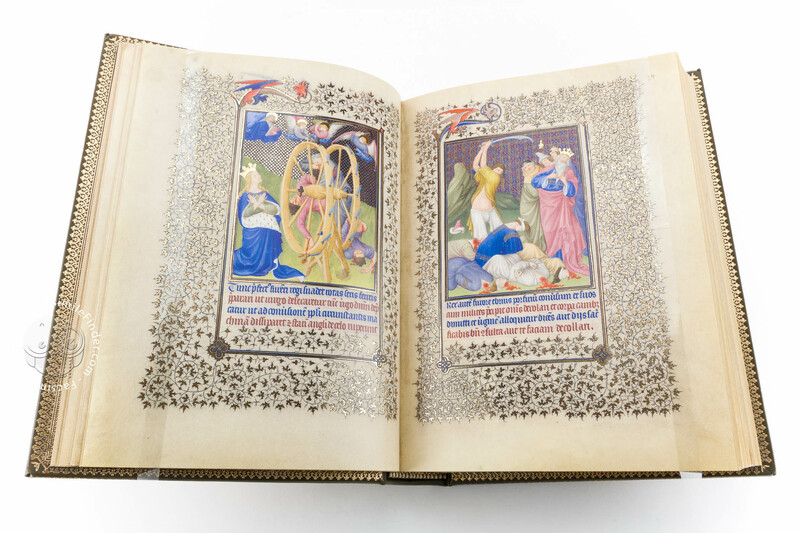 The fruitful combination of his generous patronage and their unique talent brought about a working atmosphere of unmatched creativity without which a masterpiece such as the Belles Heures would never have been possible. 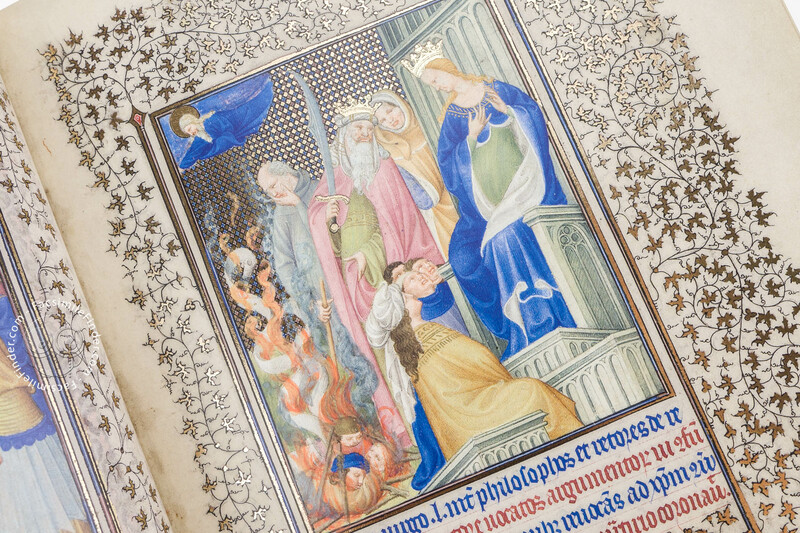 The great passion of the Duke of Berry for the Limbourgs shows particularly in the unique working process adopted for the production of the Belles Heures. 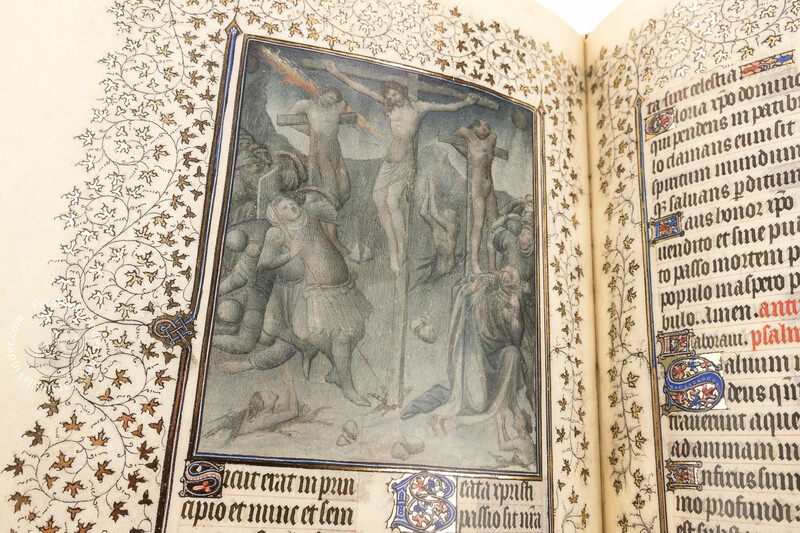 In response to their enthusiastic patron's special request, the painters executed five additional picture cycles for the codex, after it had already been completed. 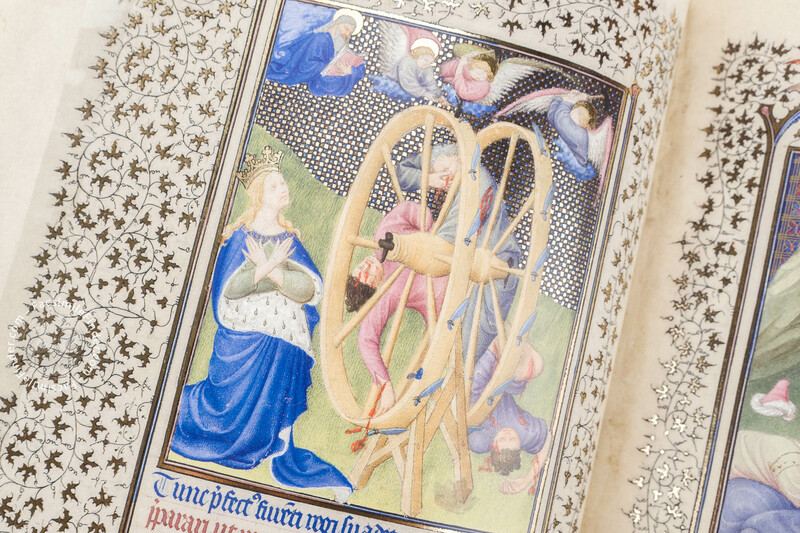 This production process is unique among the many other Books of Hours from the ducal library. It suggests that the Duke allowed the Limbourgs an extremly high degree of autonomy in acknowledgement of their talent. Certain topical innovations bear testimony to the patron's influence on his precious work. Scenes of study and learning that had never been painted in this manner before show his great interest in science and scholarship. 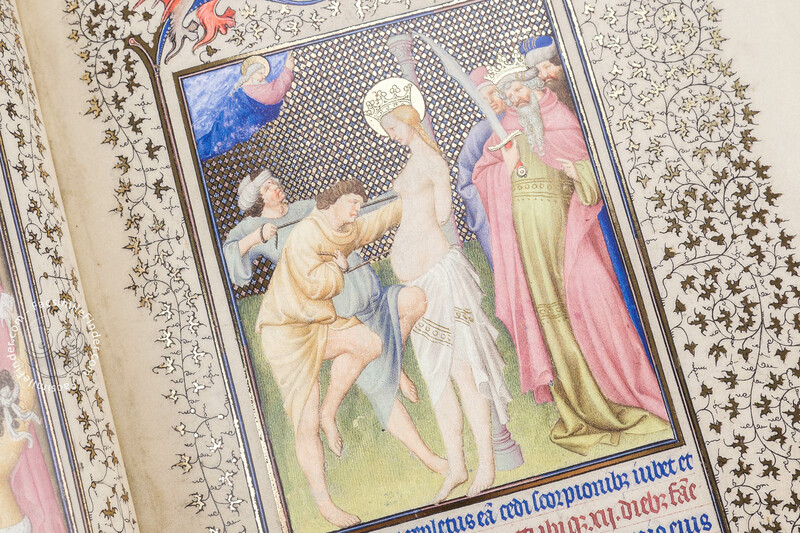 The deep veneration of the Duke for his namesake John the Baptist is reflected in a picture cycle of four miniatures. Although the perfect mastery of Pol Limbourg's pallet impresses us more than anywhere else, this picture cycle still remains a mystery to us: its pictorial vocabulary has never been completely unveiled. Manuscript book on parchment − 23.8 × 17 cm − 448 pp. 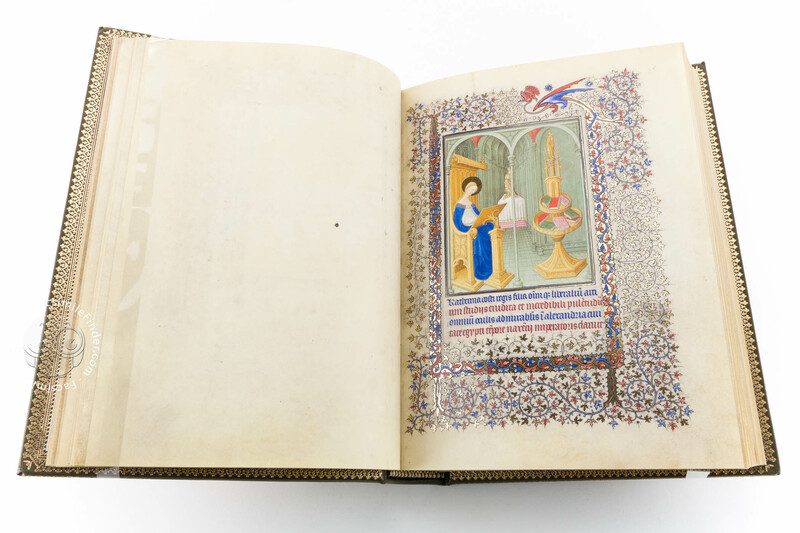 Full-size color reproduction of the entire original document, Belles Heures of Jean Duke of Berry: the facsimile attempts to replicate the look-and-feel and physical features of the original document; pages are trimmed according to the original format; the binding might not be consistent with the current document binding. Today the Belles Heures of Jean Duke of Berry are bound in an olive 17th century binding of choice morocco, richly gold-tooled all over. 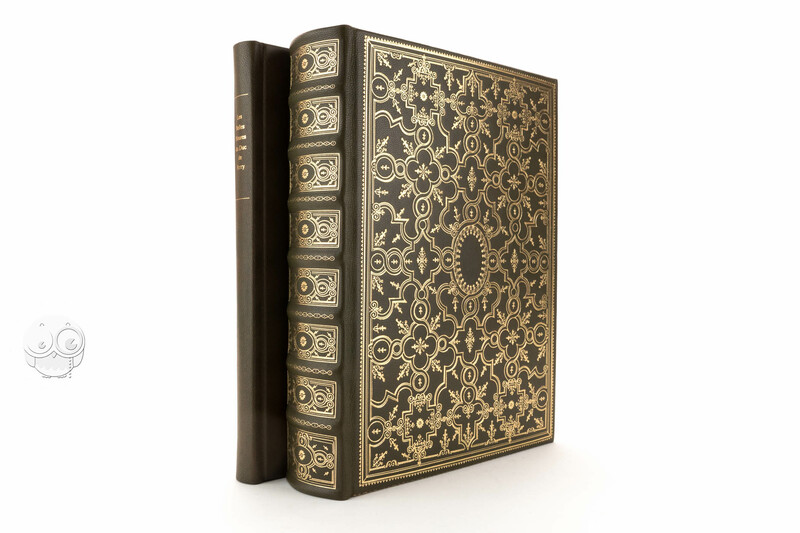 The facsimile edition features a perfect replica of this exclusive binding, including the minutest detail. 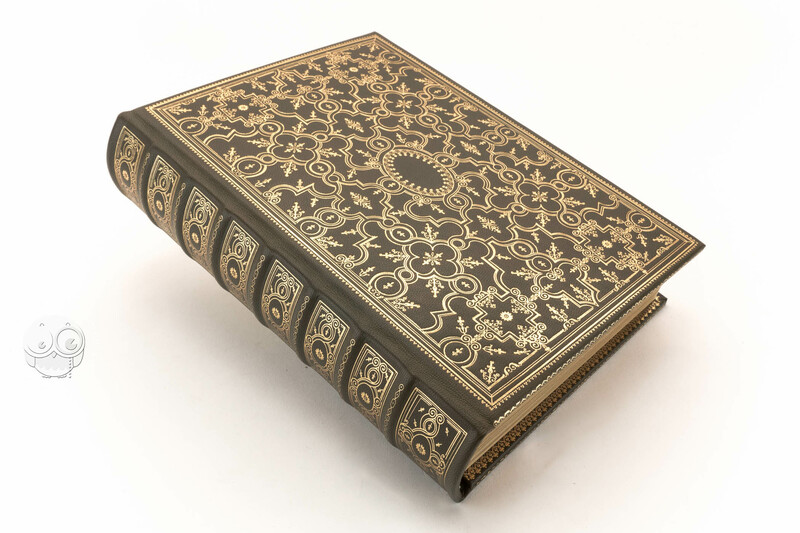 Tooling stamps were designed and made by hand, for use on the rich gilded decoration of the book covers, of the spine with its seven raised bands, and of the edges.